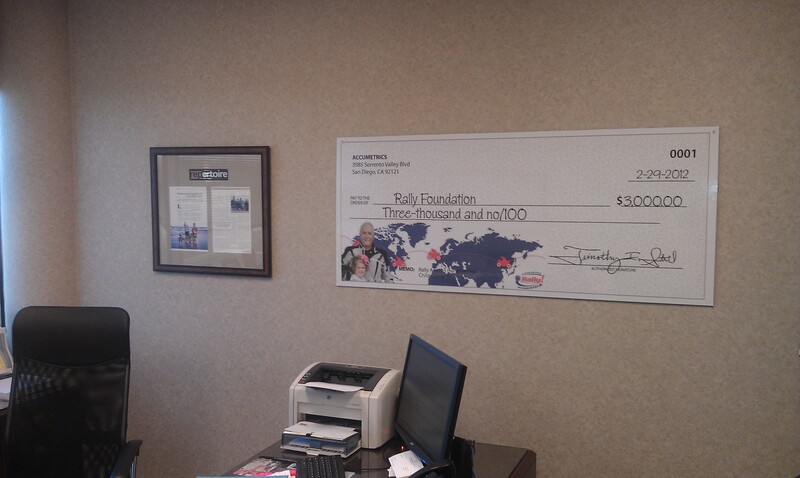 Accumetrics, the manufacturer of the VerifyNOW point-of-care clincial analyzer, donated $3000 to Rally Around the World as part of their national sales meeting in Celebration, FL…I was presented this enormous check by Tim Still and Andy Chisholm!! As part of the agenda, the Accumetrics sales group was divided into 3 teams and given the task of developing their own giving program for heart-related charities. Each team made a formal presentation to the judges, I was included, and teams were ranked based on presentation and potential effectiveness. This entry was posted in Corporate Sponsors, Rally Around the World and tagged Accumetrics, VerifyNOW by rallyaroundtheworld. Bookmark the permalink.